It is important that potential buyers are able to imagine themselves in the property without your personal or custom touches. Painting neutral colors and other small modifications can help buyers see how they can personalize a space themselves. The first impression on potential buyers will be based on the exterior of your home. Mowing the lawn, trimming the shrubbery, landscaping, and cleaning windows and doors all help give a better initial appeal. Make sure there is a welcoming feeling when people first approach by painting, polishing, or cleaning as necessary. Think “bright and fresh” inside your home. Buyers want spacious and open rooms, in addition to a sense of cleanliness. Clean, open windows are great when possible as well as bright light bulbs and light, neutrally painted walls. Removing all clutter from shelving and furniture helps buyers envision their own belongings in a room. A pleasing scent or deodorizer can help areas feel fresh and clean. These rooms are typically the most scrutinized by potential buyers and should appear well polished and simple. All appliances should be cleaned inside and out as well as countertops. A call to a plumber to ensure there are no leaky faucets or other problems can be a wise investment. 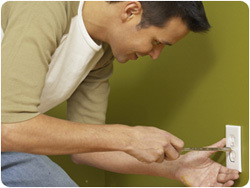 Look around for cracks, holes, or damage to plaster, wallboard, wallpaper, paint, and tiles. Also attempt to replace broken or cracked windowpanes, moldings, and other woodwork and inspect and repair the plumbing, heating, cooling, and alarm systems. Storage is a major concern for buyers, especially in the condominium market. Clean out all unnecessary items including off-season clothing to make these spaces look large and orderly. Consider investing in economical closet systems to more efficiently utilize all potential areas. Be conscious of smoke and pet odors. Although one may become accustomed to them over time, smoking and pets both come with odors that may be offensive to potential buyers. Consider smoking outside while you are selling your home and keeping pets outside during showings as much as possible. Additionally, emptying litter boxes prior to showings and purchasing carpet and air fresheners can be beneficial. Make your home as appealing as possible by keeping in mind what you would look for as a buyer. For additional help, feel free to contact us and learn what buyers in your area are specifically seeking.